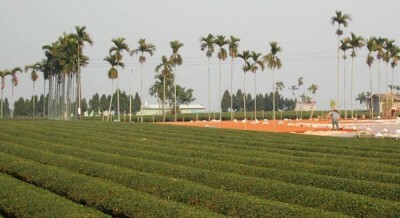 Taiwan is famous for its tea. Everyone on the island drinks lots of tea both hot and cold. There are many many kinds of tea in Taiwan, we are famous for growing the best teas in the world but at the other end of the scale there are cheap and cheerful tea shops like bubble tea shops on nearly every street corner! Today I am writing and showing you pictures of a day trip I had into the Taiwanese countryside to areas famous for growing tea. Above is a picture of an ancient tea shop in Nantou County near a temple town named Song Bo Lin. When you are in the town of Song Bo Lin the air is heavy with the smell of burning incense but when you get out of the town a little and into the surrounding countryside you get to see great expanses of symmetrical tea growing land. Above is a typical tea field in this area of Taiwan. The day was slightly overcast but sometimes the sun came through strongly. 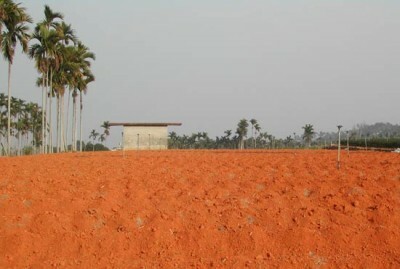 In the next picture you can see to the right a farmer is tilling the neighboring field of red earth, getting it ready for another crop. The land doesn’t look that red from this photo, perhaps its a limitation of my camera. However the next shot reveals what an amazing colour the earth has in this part of Taiwan. The Song Bo Lin area has many tea growers, it is mountain tea, rather than high mountain tea. 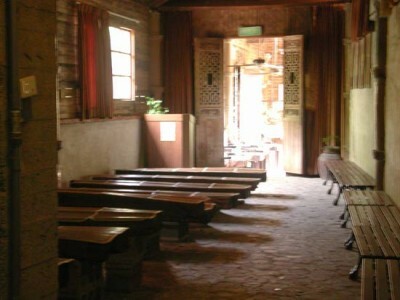 However the town is in a valley where it is often filled with moisture and mist. 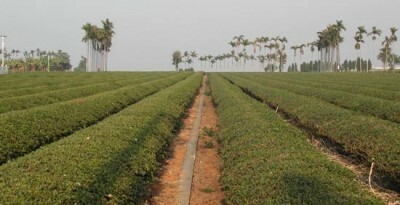 This damp atmosphere gives the tea a wonderful environment for growing and it also has a special flavor due to this environment and red earth. Incidentally the area also is great for growing ginger.